We have all heard the saying, “don’t believe everything you read on the Internet,” but oftentimes we fall for anything written by a so-called “medical expert” or is forwarded to us by a trusted source. False and dangerous medical advice is frequently posted on social media sites and then circulated like a highly contagious virus. Not only does common sense seem to be vulnerable to these myths, but also basic facts of pathophysiology. 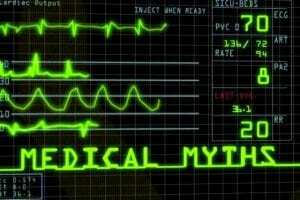 Here, Cardiac Companion debunks one such myth and it could save your life. There has been a lot of viral activity lately about an article, claiming to be supported by reputable medical professionals and institutions, on what to do if you are alone and suffer a heart attack. In fact, the “Cough CPR” that is discussed in the article began circulating in 1999 as part of a hoax email. Neither the American Heart Association (AHA) nor the American Red Cross endorses cough CPR during a heart attack. A heart attack occurs when an occlusion (e.g. blood clot) of an artery in the heart slowly causes tissue to die. This can result in chest pain and discomfort, and requires immediate medical attention to resolve. A cardiac dysrhythmia is primarily an electrical problem within the heart, and is sometimes treated with electrolytes or electrical cardioversiom\n. Cardiac arrest is the cessation of normal circulation of the blood due to failure of the heart to contract effectively. A cardiac arrest is different from (but may be caused by) a heart attack, where blood flow to the muscle of the heart is impaired. During cardiac arrest, a person is considered “clinically dead.” The person is unresponsive, has absent or abnormal breathing and does not have a pulse. The appropriate action for cardiac arrest is immediate CPR and defibrillation. The real danger about the misinformation regarding “cough CPR” is that it could prevent heart attack victims from getting the life-saving help they need. Social media posts claim that by coughing vigorously when you have a heart attack, you can keep yourself from passing out, theoretically saving yourself until your heart starts beating normally again. However, as has been explained, heart attacks are not the same thing as cardiac arrest. Anyone experiencing the symptoms of a heart attack should immediately call 911. Unfortunately, the reality is that those who suffer sudden cardiac arrest while alone, (that is, their arrest is unwitnessed) have a less than 1% survival rate because they are unable to summons help. When cardiac arrest occurs, unconsciousness and clinical death follow swiftly. Defibrillation is the only way to attempt to reset the heart once it has suffered a fatal arrhythmia. However, should you find someone who is unresponsive and not breathing, 911 should be called, CPR should be performed and an Automatic External Defibrillator (AED) should be brought to the patient and used as directed by the audible voice instructions provided by the machine. Victims of a witnessed cardiac arrest have a 7-10% survival rate because bystander intervention can occur immediately. The faster someone receives CPR and defibrillation after going into cardiac arrest, the better their chance for survival. As in all cases, 911 should also be called immediately. The American Heart Association acknowledges in their “Executive Summary: 2010 American Heart Association Guidelines for Cardiopulmonary Resuscitation and Emergency Cardiovascular Care,” published in the journal Circulation, that “despite measurable progress aimed at its prevention, cardiac arrest— both in and out of the hospital— continues to be a major public health challenge.” However, they go on to say, “Over these 50 years, scientific knowledge about arrest pathophysiology and resuscitation mechanisms has increased substantially. In our ongoing commitment to ensure optimal community-based care for all victims of cardiac arrest, we must continue to effectively translate the science of resuscitation into clinical care and improved resuscitation outcomes.” Cardiac Companion reminds us to be cautious about medical advice that is circulated via the Internet and encourages staying up-to-date with the most current AHA CPR Guidelines and learning CPR.